We hope you enjoy this look at the history of our community. Please remember we cannot include every story or the entire region. Also, forgive us for any errors- email us with corrections (and proof to back up your knowledge). If you'd like to learn more, please contact us; we can share much more with you or direct you to a person or group who may be able to help. Earliest U.S. records of this region begin in 1683, when the land was marked as part of the very large county of Albany, which included most of present day New York and Vermont. 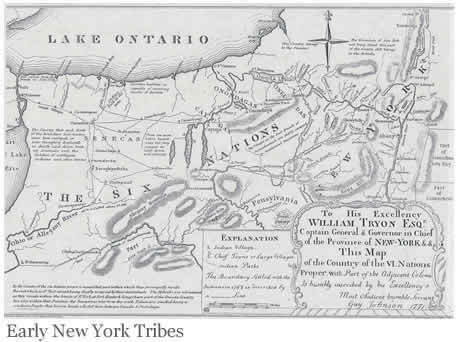 Slowly the land was divided into smaller counties, and in 1772 the Western New York land became Tryon County. Except along the Niagara River, Niagara County was a complete wilderness with only occasional openings, or plains as they were called. Magnificent trees stood hundreds of feet high, largely made of oak, rock maple, ash, hickory, pine, chestnut and black walnut. 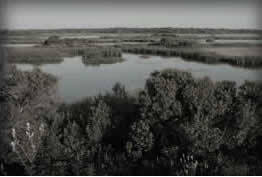 Possibly even more prevalent was the heavy amounts of marshland, created from countless streams, ponds and more. Many thousands of years ago, Lake Ontario (named by the Wyandot [Huron] people) was a much deeper and larger lake. In this area, the water covered all of what is now known as the Town of Newfane. As the water receded, the original shoreline remained a ridge of higher ground than the rest. This ridge, which spanned from the Niagara River to the now city of Batavia, was far easier to travel through than the harsh woods, and it became the major route used by local tribes. The receding waters also created vast amounts of marshland between the ridge and the newer lake shoreline. The marshes helped create very fertile soil around them, great for growing. Wild cranberries were plentiful in the area over 200 years ago. There are records of indigenous tribes living in Niagara County dating back thousands of years, and there is evidence of many different villages or camps in and around the Newfane area. On McClew Road artifacts have been uncovered of an indigenous camp or village of pre-pottery culture from 2,000 years ago. Near Jacques Road there are at least 20 sites. Several were found along Hopkins Creek, none of which are Iroquois. Often artifacts are found on sand knolls on top of ancient glacial deposits. Keg Creek was a tribal fishing site, the physical characteristics of which are still in evidence. The Kohaus or Neuters had a fort at the mouth of Eighteen Mile Creek. 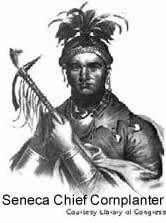 They were conquered by the Iroquois, and the region was ruled by the Senecas. At one time, arrow heads were found on nearly every farm in the region. Indigenous trails over the area influenced modern roads, including a trail along the west bank of the Eighteen Mile Creek, much used, between the Ridge and the Lake. Animals native to the area remain largely the same: deer, rabbits, wolves, raccoons, turkeys and mice, to name a few. At one time bears and beavers were very common, along with salmon. As settlers came to the area, they began killing wolves to protect themselves, which resulted in a healthier supply of deer. Early records also state that crows are not native to the region, appearing for the first time after the War of 1812. During the Revolutionary War, local tribes allied themselves with the British. In 1784, Tryon was renamed Montgomery County, to honor General Richard Montgomery. By 1789 Montgomery was divided, and this area became known as Ontario County. Following the war, colonists declared ownership of large territories of America as part of the treaty with the British. Investors in New England worked out deals with tribal chiefs through discussions and payments. Certain acres were also set aside for the tribes to keep. One such deal was the Phelps and Gorham Purchase, made by Oliver Phelps and Nathaniel Gorham in 1788. Unfortunately the giant amount of land proved too costly; they also ran into trouble making agreements with local tribes over territory rights. So in 1791 they sold, at a great discount, much of their original purchase to U.S. Senator and financier Robert Morris of Philadelphia. Morris was a celebrity in his day. He was the richest man in American, and also a signatory of the Declaration of Independence and a financier of the American Revolution. This purchase was for 3,250,000 acres and included the areas of Western New York that lay west of the Genesee River. By 1793 Morris decided to sell a large amount of acreage to the Holland Land Company, an unincorporated syndicate formed by Wilheim Willink and thirteen other Dutch bankers. The bankers hired American trustees in the United States to take title to the land, because U.S. law made it illegal for them to own the property directly. Robert Morris prevailed upon the New York Legislature to repeal that ordinance, which it did shortly thereafter, as they were eager to have the lands developed into settlements. During this time, Morris had another issue to ensure the land could transfer to the Holland Land Company: removing local native tribes and the rights to their lands. This was achieved at the 1797 Treaty of Big Tree, executed on the Genesee River near modern-day Geneseo, south of Rochester, New York. Representatives of the Holland Land Company, Robert Morris, local tribes, and a U.S. commissioner gathered at Big Tree in August, 1797 and negotiations began. Chiefs and Sachems present included Red Jacket, Cornplanter, Governor Blacksnake, Farmer's Brother and about 50 others. Red Jacket and Cornplanter spoke strongly against selling the land. They held out for "reservations," land which they would keep for their own use. After much discussion, the treaty was signed Sept. 15th, 1797. Natives were to receive $100,000 (about $1.39 million today) for about 3.75 million acres of their land; they reserved another 200,000 acres for themselves to use as reservations. The Holland Land Company began selling lots of land in the region in 1801. By 1802, Ontario County was divided into smaller counties. The Northern half of Western New York was now Genesee County. By 1822, nearly half of the Holland Land Company’s purchase was still unsold and they began offering these remaining portions at a huge discount per acre. Pioneers wanting to acquire land but were unable to pay the full price would sign "Articles of Agreement", which described the location, the purchase price (sometimes as low as $2.50/ acre) and the terms of payment. Down payments were required and ranged from 10-15%, and signers had 10 years to pay the full amount. Only when the lots were fully paid off could the new owners take possession of the deed and settle on the land. This is why much of the land was claimed but remained vacant for some time. In the early 1800's, heavily wooded acres left few places for easy travel. The main way to access to the region was the well-worn Ridge Trail, along with a few much smaller trails following waterways. In 1808 when Niagara County was established out of the once larger Genesee County, Ridge Trail was improved by the Holland Land Company, forming Ridge Road. 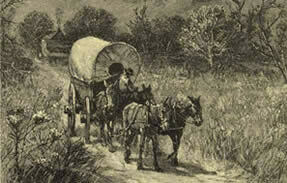 Now Conestoga wagons could travel through the county, helping many arriving pioneers to settle in the area. Largely, they chose land along Lake Ontario, the Niagara River and Eighteen Mile Creek. Records list a few of the earliest settlers to the Newfane area who purchased land from the Holland Land Company. 1804 saw purchases from Jedidiah Riggs and Joshua Slayton. In 1805 there was a land boom, with the following purchasers: Nathan Toles, William Gordon, Burgoyne Kemp, Francis Albright, David and William Wisner, William Chambers, Moses Hutchins, John Armstrong and Digby Small. Many of the early purchasers simply resold the land, which seemed too difficult to conquer, and instead continued west towards Niagara Falls, or the growing city of Buffalo. Yet a few did settle on their property years later, once it was completely paid for. William Chambers and John Brewer arrived from Canada in 1807, and were the earliest settlers of whom there is any record. They claimed land along the mouth of Eighteen Mile Creek. Burgoyne Kemp and Peter Hopkins arrived in 1808, Francis Albright and James Van Horn in 1809, James and William Wisner in 1810, and Levi Ellis in 1811. In 1809, Mr. Hopkins built his log house near the mouth of Hopkins Creek, and about 1811 Benjamin Halstead built at the mouth of Eighteen Mile Creek. Martin Burch built the first frame house in town, on Lake Road. George Lindsay also moved into the town about 1810, living on a farm adjoining the one on which his son, John M. Lindsay lived. Shubal Merritt came to Niagara County in 1812, settling east of Kempville along Lake Road. He built a saw mill on Keg Creek, north of Lake Road, in 1827. Five brothers and one sister accompanied Merritt, and they all purchased properties around his. Many settlers discovered the fine quality of the trees on their property, especially if they had white oaks, which were in high demand at the time. Many land owners in Niagara County made a good financial start selling their timber. Just as the region was reaching 2-3 dozen settled families, the War of 1812 began and changed everything. Many different reasons caused the U.S. to declare war on the British, but a turf battle over territory along the Canadian border placed the battlefront right in Western New Yorker’s backyard. 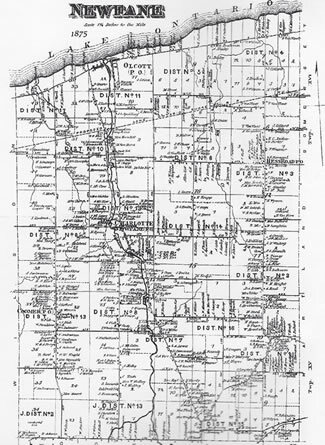 Western Niagara County saw the worst of it, and fear caused many settlers to leave the county, including the newest settlers to the Newfane/ Olcott area. In December of 1813 the war finally spilled east towards Eighteen Mile Creek. The British, with nearby indigenous allies and some Tories (British sympathizers), set about burning every home and business they could find, leaving the settlers homeless during the harsh winter season. Orders had them stop at the creek (to learn more, read Part Three). During the war British at times controlled Lake Ontario, making it necessary for locals to sneak in supplies by raft or flatboat, propelled by poles or oars, working their way slowly along the shore and hiding in the coves or mouths of creeks when a British ship was sighted. Before the War ended at the end of 1814, much of Kempville (Olcott) was also burned and destroyed. At the close of the war many returned and others came in as well. Among these were Benjamin Coomer, Benjamin Halstead, Benjamin Stout and others who settled in the northern part of this area. James McClew, and the families of McKee, Patterson, Corwin, Coates and Stout took up land along the west side of Eighteen Mile Creek. Alvin Buck and Solomon C. Wright purchased land close to Ridge Road, and James Hess and Ira Tompkins bought land in the east not far from Keg Creek. Other citizens on records in these early years were Jonathan Coomer, Elisha and Almeron Newman, Nathaniel Church, James D. Cooper, Stephen Hays, Cornelius Van Horn, John Pease, David Kemp, Henry A. Reynolds and Hiram Ferguson. One problem facing the early settlers was lack of roads. Beyond the ancient Indian trails, there was little breaks in the thick woods to navigate through. Unfortunately the labor and cost of road building was left to the new locals, with very little public aid. So for ease, settlers made roads around swamps and other barriers making paths curvy and random. Many of these early roads are now difficult to trace, with the exception of building remnants far from present roads and highways. Lake Road was one of the first to be built; it is a little south of the road that Burgoyne Kemp cut along the lakeshore for the Holland Land Company, east of the county line. Creek Road (now Lockport-Olcott) is also one of the oldest thoroughfares in the county, having been laid out as early as 1808. It was created to follow the east side of Eighteen Mile Creek from Olcott to the stage line in Wright's Corners (now Ridge Road). Sometime later a second road was laid out from Wrights Corners directly north until it intersected the present West Creek Road, which it followed to Lake Road. Lake Road was expanded in 1811 from Fort Niagara to Somerset. Youngstown Road was established in 1816. Coomer Road was laid out by Benjamin Coomer, who died in 1817. McKee Road began at Transit, ran westerly to Creek Road, crossed it north and continued on across the creek. Hess Road was laid out in the fall of 1821 by the Commissioner of Highways and Surveyor Peter Hess. Ewings Road was named from the families living along it. 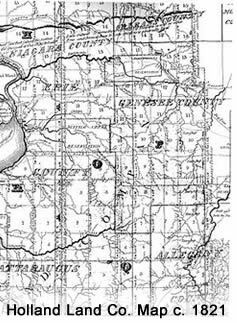 That same year Niagara County was divided one last time; the southern half was renamed Erie County. These county lines have remained the same ever since. Other challenges faced the early settlers to the area, the biggest ones coming from nature and the geography of Northern Niagara County. The region was largely marshland, with some of the swamps natural and others caused by beaver dams. This condition kept many from settling in the area. Those who remained would cut logs and use them to fill in the lower places on the property, which was a very lengthy and discouraging task. The marshes between Ridge and Lake Ontario made the land unhealthy. Illnesses attributed to living in a damp, swampy country were prevalent and thus a terrible issue for many years. About 1822 or 1823, as the Erie Canal was being completed in the county, it was discovered that the fall of 155 ft. from the Ridge to Lake Ontario would offer a solution to the drainage problem. After some study, ditches were laid out and dug, removing nearly all of the marshes. Now the area was covered in a wonderfully rich soil, perfect for farming. After proper drainage, the health of settlers improved greatly and the area was considered especially favorable for living. An old tale says that a member of one of the early settlers overcame a serious chronic illness and lived to near the century mark, attributing her long life to the healthfulness of the area. This fact, plus the completion of the Erie Canal, brought an influx of new settlers. From here, we will divide the history of Olcott and Newfane into their own pages (although their histories will largely intersect). It’s no surprise that in the early 1800’s settlers found the area that is now Olcott so appealing. Eighteen Mile Creek flows into Lake Ontario, creating a natural harbor which was ideal for finding water, food, building shelter and starting a business. It didn’t take long before the area was given its first name: Kempville, after one of the early settlers named Burgoyne Kemp. Kemp purchased land east of Eighteen Mile Creek in 1805 and arrived in 1808 after paying it off (Peter Hopkins also arrived the same year). Kemp and his party traveled from Tioga Point to Lewiston bringing cattle and sheep, in constant danger of losing their stock and goods to Native Americans, a regular occurrence at the time. He also was a major force in clearing trails and creating roads to help new settlers and establish faster trade routes. Kempville was one of the earliest established populations in the area, which began with a sprinkling of families and a handful of businesses. William Chambers and John Brewer arrived during this time and built log cabin homes on their new land, east of the creek. Chambers, Brewer and Kemp were the only known settlers to choose land on the east side at this time. 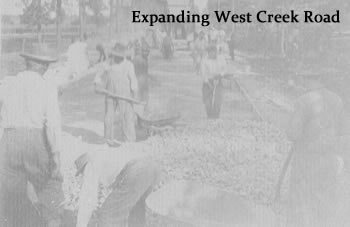 A majority of the early homes and businesses were established between West Creek Road and Eighteen Mile Creek. The first bridge in the area was a foot bridge which spanned the creek, built in 1811. Now, Kempville’s east and west sides were not so divided. 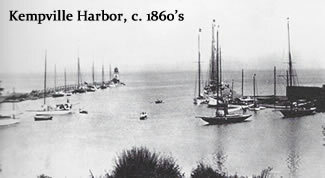 The harbor quickly became a busy hub of activity for incoming boats, travelers and businesses. Jacob Albright built a saw mill on his property, alongside Keg Creek. Lake Road was a common route for travelers crossing the county to and from the Niagara Falls area, and as such hotels and stores began popping up around Kempville. The first store opened in 1812, owned by Asa Douglas and later John Eddy; the store also held a tavern. That same year, Benjamin Halstead, who had purchased land from William Chambers, built a double log house for use as a tavern and hotel. Other early business owners included Boyce & Falwell and Henry Reynolds. Archibald McDonald opened a store in 1821, and after the building of the Van Horn Mills he opened another store near them. Shubal Merritt arrived in 1812, settling on Lake Road three miles east of Kempville, and owned a saw mill on his property by 1827. Five brothers and one sister accompanied Merritt, and they all purchased properties around his. Much of Kempville was burned and/or abandoned during the years of the War of 1812, but by 1814 the war had ended and the community was growing again (see Part Three for a more detailed look at the war). Burgoyne Kemp built a grist mill in 1814 near the mouth of Honeoye Creek, east of Olcott, and remained in business for a few decades. Thomas Armstrong began blacksmithing here in 1814, and Dr. Alexander Butterfield was the region’s first physician. Dr. John Warren arrived within a few years, serving the community until his death in 1834. Benjamin Halstead now sold his tavern/ hotel, which went through a number of families: Brady, Harris, and Nichols, before being purchased by William Cooper. Cooper tore down the basic and unsuitable building and built the Cooper House on the same site (making it the first frame hotel in Kempville). Businesses in the early decades included three ice houses, planing mill, basket factory and warehouses. James Cooper purchased land near the mouth of Eighteen Mile Creek, on the east and west sides. He built his home, opened a hotel and also built the earliest pier on the west side (beside a warehouse). As Kempville grew, he separated his east property into smaller lots, selling them to arriving settlers. The first school was on Main Street, opening in 1815 with Bezaliel Smith as the first teacher. The second school came in 1818, made of logs and located on the north side of Lake Road near Hess Road, with Martin Burch hired as the first teacher. Mr. Burch, who was also known for building the first frame house in town, had among his students: Benjamin Stout, Asa Coates, Shubal Merritt Jr., Charles Halstead, Silas Mead and F. Newton Albright, all who have descendants in this area. The Methodist Episcopal Church was organized in 1815, led by Samuel Lockwood, and by 1833 they had enough funds to construct their first building in Kempville. Their church was 40x45 feet and cost approximately $1,300,000. After its completion, Reverend John H. Wallace became their first preacher. The only tannery ever built in town was established in 1820 by John D. Cohler, but unfortunately did not last long. At the same time, Dr. Butterfield became the first postmaster of Kempville, a side job to his general practice, receiving his appointment December 4, 1820. The early mail came through Hartland Corners’ post office by anyone who happened to be journeying between the villages. 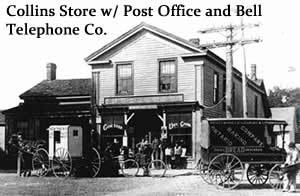 Years later the postal office relocated to Main Street’s General Store in Newfane. Dr. Butterfield would also become an early justice for the local community (he died on Nov. 19, 1867, sadly his wife passed 30 minutes later). In 1824 community members decided to form an official town, which they named New-Fane. Kempville became one part of this town, which also included three small hamlets and the village of Charlottesville (see Part Three for more details). 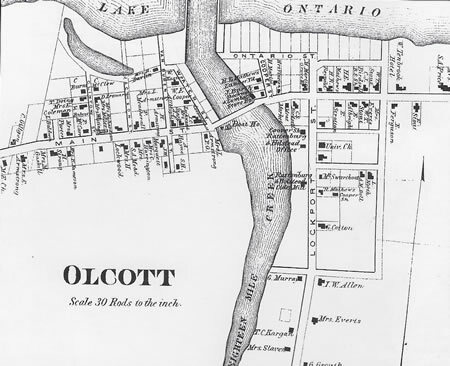 As Olcott grew, so did the need for schools. One-room schoolhouses popped up every few miles for many decades (see Part Three for more on local schools). In 1825 Lake Road came into more general use after a local, General James Wisener, contracted to replace the footbridge crossing Eighteen Mile Creek with a larger one that could hold larger amounts of traffic. It cost $500, was 400 feet long and framed by white oak (a common tree of the area at the time). This expansion helped bring more families and travelers passing through. The Wesleyan Church was organized in 1849 with William Henderson as the first class leader, alongside preacher Asa Warren. The Universalist Church arrived in 1859, led by Reverand R.H. Pullman, and was located on the lot where the old fire station now stands. 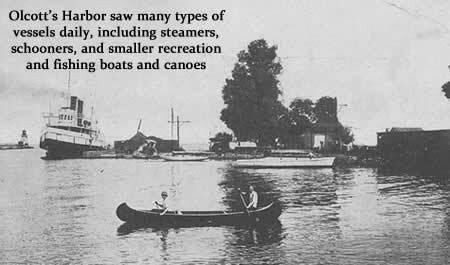 Between 1847 and 1862, a number of schooners were built in town, further bolsterng the waters along Kempville. By the mid-1800's, the harbor had become a significant port for shipping and receiving, along with a stop for passengers. One particular record remains from Oct. 29, 1871, when Kempville was greeted in one day by 7 large schooners that brought massive supplies of lumber, salt, hardware items, etc., and some were reloaded with Niagara County farm apples (mainly from Van Horn Fruit Orchards, which shipped their fruit around the globe). Local businessmen were now eager to redesign the harbor, which could provide safe and modern facilities for small and large vessels. In 1871, Mr. Theodore J. Olcott, a member of the State Legislature, was successful in securing two piers at a cost of $200,000. Construction of the new piers began the same year, and would take nearly a decade to complete. They stood on either side of the mouth of Eighteen Mile Creek and were 800 feet long. A lighthouse was also built on the West Pier, and Richard S. Mathews (grandfather of Pauline Gooding) served as the light-house keeper for 40 years. In appreciation for this generous and profitable new venture, it is said the town’s council changed the town name from Kempville to Olcott. The United States also opened a custom office in the new marina, to handle various international trades. One example is logs, which were brought in from Canada, unloaded in the harbor and floated to various mills. The growing status as a major marina in Western New York attracted investors’ attention. Large businesses were established to build ships, making Olcott known as a great ship building center. James D. Cooper also built a successful warehouse business, with a pier, on the east side of the marina. By now the wooden swing bridge in the harbor was aging, well over 50 years old, and had truthfully always been a clumsy apparatus. It was operated by two men who pried it open with long iron bars to allow boats to pass through, and then had to return it to its original state. Finally the town was able to replace it with a large swing iron bridge in 1878, allowing, for a time, travelers easier access between the lake and Eighteen Mile Creek. Unfortunately it also proved troublesome to turn, and after a few years the bridge was bolted and locked in place, permanently cutting off boat access between the creek and its mouth. During the 1860’s, William Tenbrook built another hotel in Olcott, known as The Grove House. His son, William H., also jumped into the same business, purchasing the old Cooper House hotel in 1874. Both hotels proved successful, and after a few years William H. had ideas for expansion. This couldn’t be done on the Cooper House property, however, and so he and his father agreed to exchange properties. William Sr. would continue running the Cooper House until his death in 1889. William H. was now in possession of the lovely Grove House, one of eight hotels in Olcott at this time. Located on Main Street and facing Lake Ontario, it was a good sized property which included the lovely grove across the street and bordering the lake (hence the hotel’s name). The grove would become known as “Tenbrook Grove” by locals. The hotel would be one of the more prominent in the area, and the Tenbrook family would be very involved in the community. Tenbrook Grove was open to the public, not just hotel guests, and was a very popular place for family picnics and gatherings. In 1877, Andrew Tenbrook (brother of William) started a new organization, The Niagara County Pioneer Association (NCPA). Stories say that Andrew had lived and seen the earliest days of the settling of Kempville, and had experience the creation of a community within the harsh wilderness. This was his inspiration to finding a way to honor the original settlers and their hard work and devotion to the area. The association was dedicated to celebrating the pioneer lifestyle which had founded their community. At the initial meeting only six people were in attendance, but that did not deter Mr. Tenbrook. To introduce the group to Western New York, he decided they would host a picnic on his family’s property, Tenbrook Grove, the pine grove beside the family’s hotel, The Grove House. The picnic was held in August of 1877, and about 1,500 guests attended from mainly Niagara and Orleans Counties. It was considered very successful and a great time was had by all, convincing the organizers to make the picnic an annual event. By the second picnic guests totaled around 5,000. Mr. Tenbrook was said to really love his grand picnics, and was always thinking of new and exciting additions for the following year. The annual Pioneer Picnics quickly became the event of the year in Olcott, and guests came from as far away as Buffalo, Rochester and beyond. The event welcomed nearly everyone, and each year the association invited guest speakers. Local businessman and politician, the Honorable Burt Van Horn was one of the first, speaking to the crowd in 1879 about his own pioneer family’s achievements, including his father’s mills. This would eventually lead to local and national dignitaries speaking at a majority of the picnics. Other speakers in the first decade included the Hon. John E. Pound and Hon. Lyman A. Spalding. By 1881 the attendance had grown to 12,000. The attendees and speakers at the picnics were a veritable “who’s-who” of local 19th century life. By now the NCPA, the first historical society in the county, had members collecting various artifacts and keepsakes. In 1887 members decided it was time to build a permanent building to store this collection, and which would serve as a meeting place and ceremonial home. In June of 1888 the cornerstone for their new, small building was laid, with design plans for a simple, yet sturdy log cabin. To save money, a large portion of wood, bricks and stones were donated…some pieces came from older buildings around Lockport and Wrights Corners (the remaining stone came from Lockport quarries). To add to the building aesthetic and honor the founding families, the ends of each log had a name that matched a pioneer family who both settled in the area and were members of the Pioneer Association. On August 8, 1888, with picnic attendance estimated at 10,000, the NCPA dedicated their new “Ye Old Log Cabin.” A brass band composed of Tuscarora Indians was one of the highlights of the picnic, and the building was officially completed later that same year. The impact of the marina's large piers continued. It was especially great for local fruit growers who could get their produce out by ship to Toronto and later the world. Orchards have always thrived here in part from Lake Ontario’s moderating effect on the climate. Farmers' shipped barrels of local fruit beyond the country, helping make Niagara County apples a delicacy in Europe. Olcott was also a hub of activity for boats, fisherman and tourists. In the late 1800’s commercial fisherman could fill fish pens with many kinds and sizes of fish. A ten pound sturgeon could be purchased for around 10-25 cents, which was enough to serve a small family. The rural character of the area also helped dictate its industry; barn building was important as were cooper shops and a basket factory, many who needed water in great amounts or were located along the creek or lake. By 1890, the town was growing steadily. This brought in contractor William J. Blackley who, with the help of other investors, purchased The Grove House and surrounding grove from the Tenbrook family. They remodeled and renovated the entire property, transforming it into The Albright, a fashionable hotel in its day. People could rent rooms by the day or month, and it was one of the most popular choices for visitors in town. Tenbrook Grove was now more often called simply Pine Grove. There came a time when Olcott was referred to as the “French Riviera of Lake Ontario.” The Pioneer Picnics, a growing economy and a boost in tourism helped, however it was the years leading into the 20th century that rapidly changed the town into an amazing place to live and visit. While Olcott had its share of stores, over a dozen hotels and water activities, the time had come for a true anchor to bring repeat visitors during the warm months (rather than the more common travelers passing through or visiting only for the once-a-year Pioneer Picnics). This anchor came in the form of a fresh mix of technology and fun: an amusement park. 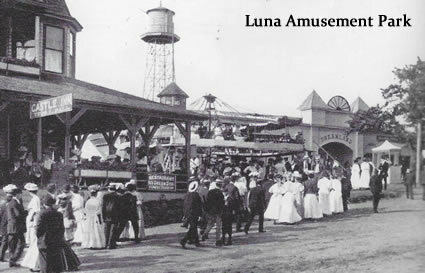 Luna Park, or Luna Amusement Park, sat on the shore of Lake Ontario along the corner of Main and Cooper Streets. It opened to the public in 1898, predating Coney Island’s Luna Park by five years. Luna Park was very different from amusement parks today; its major feature was a section of the beach and lake suitable for swimming. On one side of the park sat The International Hotel and Castle Inn which offered rooms, a restaurant, ice-cream parlor and many shops. The park also held Dreamland Dance Hall, a popular venue for live entertainment. The name of the dance hall and its inscription on the arch spanning the park's main entrance led to many people calling the park "Dreamland." Smaller-scale mechanical rides were gradually added, including a circle swing ride. The town was also attracting a number of professional photographers, who took most of the surviving images of Olcott during this amazing point in time. Up until this point, travel to and from Olcott was limited to horses and wagons. The International Railway Company (IRC, also known for a brief time as the International Traction Co.) eventually extended an electric trolley route from Lockport to Newfane, which became a popular mode of transportation. These electric railway cars often had freight on board as well, sending Newfane products to Lockport, Buffalo, Niagara Falls and beyond, further improving the local economy. Anyone looking to venture into Olcott would arrive in Newfane and continue on by stagecoach for the final few miles. Records show the final driver on this route was Bill “Hap” Marquette. Around 1898 the IRC began quietly purchasing land from Newfane to Olcott, laying the groundwork to hopefully extend the trolley line to Olcott. Late spring through early autumn was the peak time for tourists and family gatherings in Olcott. The three biggest events in town were Decoration (Memorial) Day, Fourth of July Celebrations and the August Pioneer Picnics. By now, the Pioneer Picnic crowds were filled with high society, and as such political fortunes were determined. 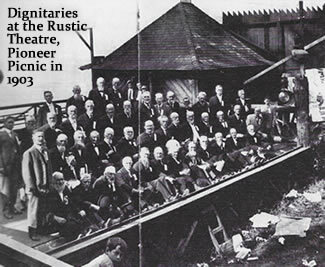 Various popular bands in their time also played at the site’s Rustic theatre, among them Victor Herbert and his 22nd Regimental Band. There are also records of speeches made by the earliest pioneers, although more often it was storytellers recounting the tales of those who had since passed. One of the most well-known visitors to Olcott was a man destined to become president of the United States: newly elected Governor of New York, Theodore Roosevelt, who attended the 1899 Pioneer Picnic. 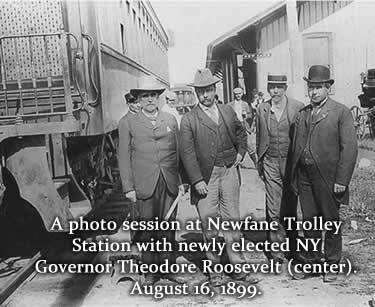 On August 16th he arrived at the Newfane Trolley Station and posed for photographers, before journeying on to speak before a crowd of 20,000. This widely publicized event further boosted recognition of the area, and as Olcott reached the new century it was one of the most popular tourist destinations in Western New York. 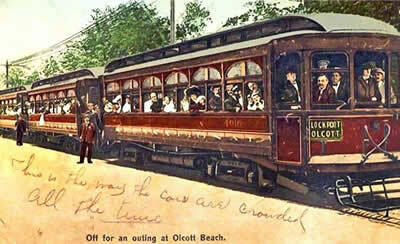 With Olcott’s fast growing popularity, it became an ideal time to expand the trolley line. The project was spearheaded by IRC manager and Newfane businessman Burt Van Horn II, along with support by William H. Corwin, a former town supervisor who was very involved in the community. The expansion would extend the line from Newfane directly north to the eastern entrance of Pine Grove; it would be known as the Lockport & Olcott Beach Railway. Olcott Station and the trolley line were officially opened for general service on August 29th, 1900 for the 24th Annual Pioneer Picnic, with William H. Corwin appointed the first general freight agent. The picnic was a major public event, with 12,000 people traveling on the line the first day, helping boost the picnic attendance to 25,000. The speaker that year to welcome the trolley line was Senator William F. Mackey, who arrived in a special trolley car which also delivered a party of prominent citizens from Buffalo including Burt Van Horn II and the Honorable Caryl Ely, President of the International Railway Company. The schedule at this time was two and three car trains leaving Lockport every 30 minutes, beginning at 5am. The trolley helped local farmers greatly, who could now send their produce to Buffalo’s popular Elk Street Market where they could make greater profits. The trolley line and steam locomotive lines crossed at one point in Burt, and so to keep the lines safe and avoid accidents, instead of the lines crossing directly, the trolley line had a large underpass built below the railroad line, complete with large, heavy stone walls. Burt Van Horn II also had a spur track added to the trolley line which ran to his family’s nearby cold storage buildings along Creek Road – as profiting from the track was always the main goal for his wanting the lines added locally. Another way to arrive at Olcott was by water. Steamers and paddle wheel boats quickly became commonplace in the marina, ferrying passengers on both short outings touring the shoreline, and longer trips to various destinations. Boats had round trip routes to Rochester, Syracuse and other large cities. With the addition of the Olcott Trolley Station, Olcott also became the perfect midway for excursionists venturing across Lake Ontario to Canada, primarily Toronto. With the railway, water and tourism improvements at the turn of the century, the village began making improvements as well. Old buildings and hotels underwent renovations for a livelier appearance, while new buildings and businesses sprang up all over. This included a new boathouse, a very nice ice cream parlor and restaurant, and a new stone chapel, St. Andrews by the Lake. Around this time, local veterans united to honor their fallen comrades in the civil war. They placed a handsome monument at the intersection of Lake Avenue and Main Street. It would later come to reside at the entrance to Krull Park, before finally returning to its original intersection, albeit slightly north. The monument stood alongside Castle Inn and across the street from the Olcott Trolley Station. By 1899 the IRC had also acquired other properties in Olcott, hoping to boost ticket sales on their upcoming trolley line from Newfane. They obtained ownership of the large and breathtaking Pine Grove and surrounding properties north of Main Street from The Albright Hotel owners, forever changing Olcott’s landscape. They very quickly began improvements, starting with natural enhancements such as trees and gardens. Next they constructed their Rustic Theatre, a very pretty open air theatre in a rustic design, built inside a natural ravine. It could seat hundreds, and was used for plays, performances and guest speakers during the Pioneer Picnics. One of the productions on record was “Peck’s Bad Boy.” Farther west in the grove they added a shelter, refreshment booth and a number of pretty little kiosks. The IRC also began building a substantial cement breakwater wall at the foot of the grove’s high bluff, which finished in 1901. The face of the bluff was then smoothed down and sown with grass, becoming a beautiful sloping verdure-clad bank, instead of rough sand. All of these remarkable additions however, would pale in comparison to their biggest project. 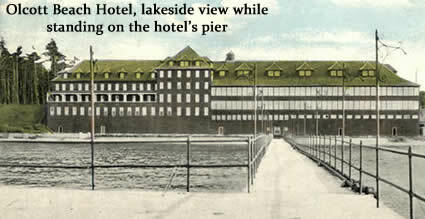 In 1900 construction began on the mammoth Olcott Beach Hotel, named for its location at the west end of Pine Grove along the southern Lake Ontario shoreline. In its day, and for decades after, it was considered one of the finest hotels on the Great Lakes. It opened to the public on June 22, 1901, although construction was not finished. The Formal Opening (after completion) was held on June 6, 1902, and starred Victor Herbert and the Pittsburgh Symphony performing in the 14,000 square foot ballroom. The gigantic, five-story hotel was a very modern yet one-of-a-kind design when it was built, and nowadays would be considered a resort. The upper floors held one-hundred luxury rooms. The main floor featured a bandstand stage they named 'Casino', dining room, ballroom and an outdoor balcony, where folks could get fresh air from the banks of Lake Ontario. The lower tiers offered a bathhouse, beauty salon, barbershop, various gift shops and later Boekmann Photography Studio. 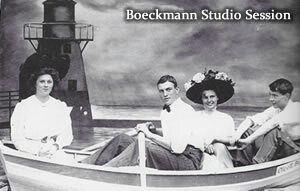 John Boekmann took thousands of photographs of tourists and locals in his studio during its life, from about 1905-1912. He had various lake and carnival themed backdrops, and a great many photos that exist from Olcott today are people shot inside this studio. The bottom tier also opened up to the beach, one of the main features of the hotel. Olcott Beach Hotel drew folks from all over the world, and some of the more notable names include guest performers Louis Armstrong, Benny Goodman, Glenn Miller and Victor Herbert. Today, one can only dream of the many events, activities and memories that happened at this great hotel. 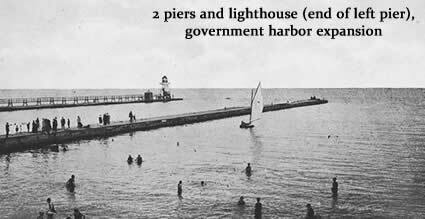 In 1902 IRC continued expansions by constructing a great steel and cement pier which would extend 300 feet into Lake Ontario. The pier surrounded the waters near Olcott Beach Hotel, allowing small boats to dock on the outside while bathers could swim on the inside. While you could swim along most of the shoreline, the hotel’s swimming hole was largely safe from boats and large waves so it quickly became the preferred choice for both visitors and locals. The IRC now decided to invest in their own amusement park, hoping to further boost trolley and hotel traffic. 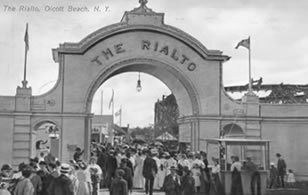 Their venture became The Rialto, which opened in 1902 across from the Olcott Beach Hotel, and was an instant sensation and strong competitor to Luna Park. Located slightly east of Eighteen Mile Creek, it was home to a wooden rollercoaster, merry-go-round (carousel), Ferris wheel, Figure 8, Bump-the-Bumps, skating rink, bowling alley and more. Smaller venues included a fortune teller, picture taking concessions, games of skill and refreshment stands. The IRC also built a miniature railroad between The Rialto and Olcott Station, so people exiting the passenger rail would immediately board the smaller vehicle and continue on to reach the amusements. By now Olcott was a major tourist destination and business port, and there were hopes it could grow to something greater. About 1902 the federal government granted an appropriation to deepen the harbor at Olcott, which took a number of years to dredge. The hope was this would accommodate the great lake ships and steamers expected to dock there. And they did, in decent numbers for many years. Residents also hoped Olcott would become a key port for the major iron and coal trades, but that never came to fruition. In 1903 the local trolley lines received a significant upgrade. Up until now the trolley lines were powered by a coal-fed, steam powered generating plant on the east side of Eighteen Mile Creek, a few feet north of the Burt Dam. This wasn’t practical or economical, so on Aug. 25, 1903 electricity was contracted through Niagara Falls. Olcott maintained its prominence as a popular recreation stop and a major venue for live entertainment into the 1910's. The marina remained a popular stop for both steamboats along the shore of Lake Ontario and inter-urban trains connecting Albany, Niagara Falls, and Buffalo. In 1911, five sailor friends met regularly to discuss boating, the lake and more. The men- Harry Shaeffer, Feber Gooding, Wilton Paull, George Starling and Captain Kenneth Hedley- met in the cabin of Hedley’s yacht, The Albertha. 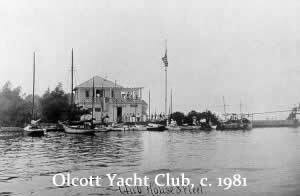 In 1920, the friends spent $200, purchasing a vacant lot, and another $2,800 assembling a new clubhouse, which became the Olcott Yacht Club. The Yacht Club is still around today, one of the oldest active groups in the area. By about 1912, John Boeckmann was tiring of being in the photography business, and closed its doors at the Olcott Beach Hotel. Having an interest the restaurant industry, and so he took over the Castle Inn and nearby Castle Theatre. Olcott, similar to the entire country, also was impacted by alcoholism. Women everywhere were often subjected to great amounts of violence in the home due to alcoholic relatives, with few laws in place for protection. This was one of the mjor driving forces behind U.S. Prohibition (1920-1933). The town of Newfane was “dry” following the civil war, but that did not stop private use in homes, or in secret use at local establishments. Olcott’s high rate of visitors seeking pleasure made for continuous problems for locals, law enforcement and businesses. One of the major reasons the Methodist Episcopal Church moved from the West to the East side of Eighteen Mile Creek was to help fight alcoholism on the East bank. Temperance groups often targeted the hotels and bars with protests prior to Prohibition. Although it ultimately failed, Prohibition helped shed light on domestic violence and the need for better protection laws. Olcott’s revered spot in local tourism took a very hard hit from an unexpected source. At the end of World War I, automobiles quickly replaced trains and steamboats as the city's primary method of access. With the rise in car ownership came a new interest in people hitting the road and traveling wherever they wanted, no longer restricted to the routes of railways or lengthy trips by carriage. When compared to big cities and beautiful nature parks, Olcott slowly sunk down the list of places people wanted to visit. As tourism dollars declined in the region, so did local businesses, although both amusement parks amazingly continued to see profits, even as similar parks closed all over the country. Nature in the most brutal form took its toll very often in Newfane: numerous fires destroyed businesses and homes, a common event prior to the formation of local firehouses. One such fire was in 1920 which destroyed the Trolley Station, although it would be reconstructed. 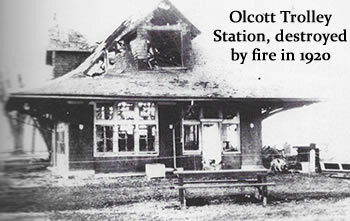 Olcott Beach Hotel also suffered a massive fire, and it too was rebuilt and remained in operation. Unfortunately various other businesses and homes around Olcott were destroyed in fires, and were rarely restored. One local business defied the odds: Elmer Bye and his wife opened a tiny popcorn stand on Main Street in 1923. To attract more business they later moved it closer to The Rialto, and as businesses were lost all around them, Bye’s Popcorn continued on. One of the worst tragedies came in 1927 with the Cooper Street Fire. It rapidly overtook over the street, taking with it the Albright Hotel, Castle Inn, Dreamland Dance Hall, Luna Park Amusements, the new trolley station and most of Main Street. Everything was burned so badly nothing could be repaired, so the businesses were demolished. None would be rebuilt, and the properties were put up for sale. The trolley line would remain in service, but the station was never rebuilt. The Rialto Park would close its doors this year as well, after slowly shutting down rides in the previous years to save money; it was torn down in 1928. The Cooper Street fire was likely the final straw for many in the community who’d dealt with many fires over the years. This was the biggest however, and many locals witnessed the tragedy unfold in person. The center of their village now held blackened lots and burned out buildings they once frequented. And so, in winter of 1927, a group of men met around an old, oak heater at the local Leonard Brothers Meat Market. They all agreed it was time to protect the community and their own personal investments, so they began a petition and collected donations to form a volunteer fire company. They were successful, and on May 28, 1928 a certificate of Incorporation of the Olcott Fire Company was approved by the State of New York. OFC remains in action today, although the firehouse has changed locations. John Boeckmann was one businessman who remained undeterred by the loss of his Castle Inn, and started construction on a new building. The New Castle Inn stood at the corner of Main and Franklin Streets and housed a bakery, hot dog stand and storefront popcorn machine. He later built a restaurant on the north end of Franklin Street called “Boeckmann’s,” which he operated until his death in 1948. Boeckmann had such determination for seeing his businesses thrive in Olcott, it is encouraging to see his restaurant still stands and has been open for business most of its life, including today, known to locals as Mariner’s Landing. The Annual Pioneer Picnics were also waning. It had been over 50 years and many of the founding Pioneer Association members had long passed away, while their families had left the region or chose not to remain part of the association. The drop in visitors to the area also left the picnics considerably smaller events; guests in the early days likely wouldn’t recognize the later picnics as the same event. Among the last recorded major speakers at the picnics included U.S. Senator Robert F. Wagner (1931). The next disaster to befall local tourism came from the Great Depression. Money was scarce, and so businesses which suffered most involved recreation, such as hotels, restaurants and attractions. 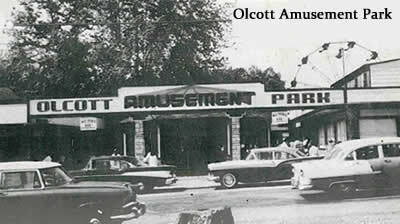 Any families still traveling to Olcott now came by car and returned home the same day, hitting the hotel industry hard. By 1937, the trolley line was shut down and Olcott Beach Hotel was a shell of its former self. The decision came to close the doors forever. The grand building was demolished immediately, which to this day remains the town’s greatest architectural loss. All that remains is parts of the foundation, consisting of a stone staircase and landings, which eventually were remodeled and added to the public beach. The pier was abandoned and has been slowly reclaimed by the lake; only small parts of stone remain visible continue to degrade. The loss of the amazing structure marked the true end of local tourism for many in the community. 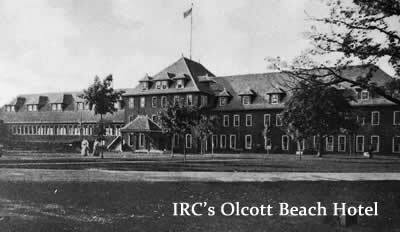 In late 1937, the IRC placed the now empty Olcott Beach Hotel lot for sale, along with Pine Grove and all the land surrounding the closed trolley tracks from Lockport to Olcott. Pioneer Association members were immediately interested in purchasing Pine Grove to preserve their log cabin and the original home for their picnics. They had even fought the IRC to not tear down their cabin at the same time as the hotel. Enter Frederick Krull, a well-known county political leader and banker from Niagara Falls who had once served as president and director of the Pioneer Association. His father, Charles Krull, was one of the founding members of the association. Without hesitation, Frederick Krull used his money and purchased 325 acres of IRC land, which included the hotel lot, Pine Grove and trolley track land directly south of Pine Grove. He donated it all to the county so it would remain a place for families to gather for recreation. 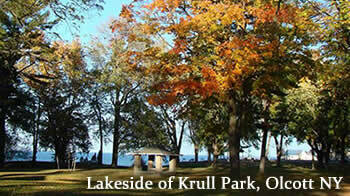 In his honor, the county named their new property Krull Park. The park remains the largest county-operated park in Niagara County. Unfortunately, saving Pine Grove was not enough to save the Pioneer Picnics. The Pioneer Association decided to halt their annual picnics in 1941, due to the onset of World War II. There would be only one more picnic, in 1946 with 500 in attendance. Following the war, association membership continued to decline, and the decision came in 1956 to disband. The organization was officially dissolved in July of 1956, and the entire collection of artifacts was turned over to the Niagara County Historical Society (with the exception of a few items which were returned to the original donor’s families). The group’s log cabin was abandoned, which was already decaying and rotting since the logs were never weather-treated. And so out of necessity and safety, the cabin was torn down in 1957. World War II also brought the need for iron and other metal materials and scraps. The town of Newfane removed nearly all the unused trolley and train tracks and donated them to the war effort. Today there are few places you can locate any original track locations or remnants, as what little remained degraded with time, taken by collectors or buried by new vegetation. Following World War II, the Bye’s family decided to relocate their popcorn stand to the front lawn of their new home, located on Lockport-Olcott Road. Bye’s Popcorn has remained in this location ever since, continuing to attract business in part due to the family’s secret caramel recipe. By the mid-20th century, Olcott was known as a small, quiet village, with fishing the remaining major draw for visitors. But plenty of community members still remembered the “good old days,” and although large businesses were no longer looking at Olcott, many people did what they could to keep the community thriving and celebrating its wonderful past. 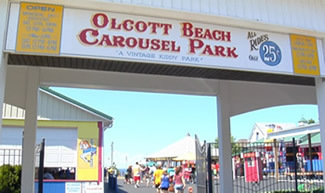 In 1940 Olcott Amusement Park opened its doors, and a number of small shops opened as well, the first resurgence of the community since before World War II. It would remain open until 1986. The Amusement Park saw new competition in 1942 with the New Rialto Park, built at the site of its namesake. It stayed in operation, in a slowly shrinking form through 1992. Neither parks saw anything near the massive success of the Luna or Rialto, but they were quite popular with locals and each made memorable marks on the community during their time in operation. The bridge crossing the harbor was now ancient compared to modern construction, and its location impeded the growing fishing industry as no boats could access Eighteen Mile Creek from Lake Ontario. In 1970, the old iron bridge was torn down but the new bridge was not built on the same site. It was moved 800 feet upstream from the mouth of the river, and the high level span was erected by the state government. 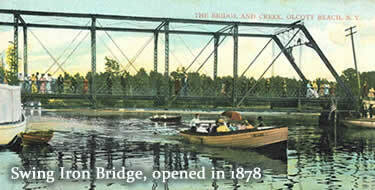 The bridge was now part of Lake Road, not Main Street, and boats could easily flow between the creek and lake. Part of the reason for relocating the bride was due to an attempt to add Lake Road (Route 18) to a new major highway route from Rochester to Niagara Falls (part of the Lake Ontario State Parkway). The road was expanded, and became a major route cutting directly through Olcott. Main Street, cut off from Lake Road and without the bridge, became a stunted road on both ends, no longer seeing the traffic it once had. Too many communities along Lake Ontario were not happy to see this super highway built right through the middle of their small villages, largely because of noise, pollution and safety concerns. And so the Parkway that had already been started in Rochester was rerouted, with a portion ending app. 20 miles east of Olcott. Lake Road continues to be a popular scenic route on the remaining journey to Niagara Falls; the partial road changes in Olcott were never fully realized and thus remain slightly awkward in design. For decades, The Seafood Bar was a popular destination in Olcott. Serving amazing food and great prices, it was common to see locals gathering along its storefront most nights into the late hours. It was one of the more popular ‘hang-outs’ for teens, families, and anyone looking for a good meal or to socialize. Another popular business was the Olcott Skating Rink, attracting kids, teens and families who could enjoy great music, roller skating and candy, along with meeting people and creating wonderful memories. In Feb. 1968, Michael Rann, owner of the Black Stallion Tavern in Olcott, took a plunge into the freezing winter waters of Lake Ontario, accompanied by a handful of friends and tavern customers. Their swim was to prove locals were heartier than anything Mother Nature could bring to the community. 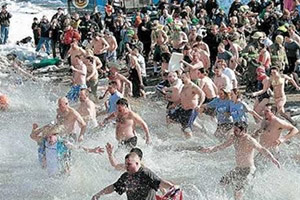 This fun moment inspired Rann, who established the Polar Bear Club the following year, encouraging anyone to come and take the same mid-winter dip into Lake Ontario. This tradition lives on as Polar Bear Sunday, happening in early March. It is organized by the Olcott Lion’s Club, although the entire community takes part in various ways, making it a full day of food, drink and entertainment. Since 1998 the event has been run for charity, currently "Swim for Sight" and is one of the largest fundraisers in the local area. This has encouraged a huge growth in the number of annual swimmers. 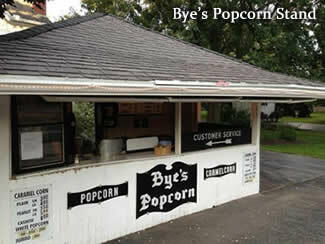 In 1966 Bye’s Popcorn Stand was sold by from the Bye’s family to new owners. The popcorn stand went through two owners before being purchased by Dane and Patricia Drewes in 1970, who continued the operation with barely any changes. The Drewes operated it as a part-time business until 1983, opening for longer hours to satisfy the growing amount of customers. The success of Bye’s Popcorn Stand remains today, as it edges towards being open for nearly 100 years. The tiny stand continues to defy odds, for many reasons: their ever constant ingredients and recipes (some secret) preserve the popcorn’s quality. The stand has also maintained amazingly low prices and a simple ordering system. These have helped establish a loyal customer base who have no problem waiting in long lines to purchase the same popcorn they have enjoyed their entire lives. Bye’s Popcorn Stand continues to see current and former community members returning every summer, along with tourists who seek out the stand after hearing about it from friends and family. One thing has always been part of the heart of Olcott: tourism. From the marina and fishing, to events and lodging, giving guests wonderful memories during their visit has always been engrained in our community members. There is a deep love for this small town that saw and experienced amazing things long before the current generations were born. Many different people and groups have worked together on projects since the mid 1990’s to revive long departed traditions, attractions and events. Most have proven successful, allowing Olcott to enter the latest century with a renewed vitality. Fireworks to celebrate July 4th have been a mainstay for the community for nearly a century, and continued to draw large crowds of locals, former residents, and tourists to Olcott to celebrate Independence Day together. The Pirate’s Festival and Old Olcott Days are also popular summer events that have seen moderate success from the late 1990’s through today, and continue drawing locals and tourists to celebrate all the community has to offer. In 1999 a major effort began by locals, led by Dr. Rosemary Sansone, to reinvigorate tourism by restoring the empty carousel roundhouse building that still stood on the site of the former Olcott Amusement Park. A committee was formed by the Krull Olcott Development Committee, which included Sansone, Jane Voelpel, Tom Kelley, and Kelly Artieri. Through massive fundraising and restoration efforts, the roundhouse was restored and a 1928 Herschell-Spillman carousel was purchased and restored. The all new carousel celebrated its grand opening on May 17, 2003, and as a special treat, three men (Ed Sandusky, Al Wilson, and Jim Updegrove) who had operated the carousel at the Olcott Amusement Park fifty years prior were on-site to control it for throughout the day. The Olcott Beach Carousel Park was born, and the committee continued to grow in volunteers and fundraising efforts. Since 2003 the park continues to grow, among the additions include 5 more vintage kiddie rides with pavilions to shelter them, Skee Ball machines, a 1931 Wurlitzer Band Organ, the Tom Kelley Rustic Theater, a gift shop and food stand. A replica of John Boeckmann’s photography studio from the early 20th century was also built to house vintage arcade games. Car shows now happen along Main Street nearly every weekend throughout the summer, culminating each September with the massive Olcott Beach Car Show. Held in and around Krull Park, it’s the largest one day auto show currently held in Western New York. 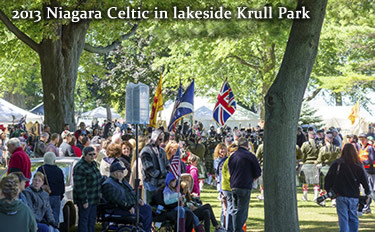 From 2001-2018, the Niagara Celtic Heritage Festival & Highland Games was held in Olcott. It began by local families to celebrate their ancestry and heritage. The weekend event saw 12,000 people to Krull Park every fall before it relocated to the Niagara County Fairgrounds in 2019. What we know today as the community of Newfane began as many different properties owned by pioneers. None set out to create a town, but to claim ownership of their own land along Eighteen Mile Creek and nearby Keg Creek. This region was far from any populated areas beyond the burgeoning nearby settlement of Kempville (Olcott). For this reason, the land was not suitable for new families who preferred the safety of being closer to established civilization, such as the villages of Buffalo and Niagara. Instead, the area was founded by businessmen hoping to find their fortunes. A few of the earliest property owners were William Wisner (1810), Levi Ellis (1811) and Zebulon Coates (1811). William arrived with his young brother, James, only 12-14 years old at the time, and the two quickly established a home and arranged for William’s wife and children to join them soon after. Francis Albright, from Genesee County, arrived in 1809 to view the land he had purchased, 200 acres west of Keg Creek. He sent his 24 year-old son, Jacob to claim it in 1810. Jacob traveled with his wife and young child and a small team of ox, one horse, and a hired man to help with the land. After weeks of travel, they arrived and were greeted warmly by their new neighbors, The Wisner family. Three others recorded to have settled early on included Nathaniel Swarthout and Zebulon Coates and the Mudgett family (no dates recorded). The most popular form of business became milling, which took advantage of the amazing power captured from both creeks. Between 1810 and 1811 the first mills arrived: a saw mill and gristmill, both built by James Van Horn and his partners. By early 1812 the first tavern of the area was built on the west side of Eighteen Mile Creek, a popular place for staff of the mills and those passing through the area. The mills were located on lands south of Kempville and locals, for lack of the land having a name, began calling the area Millville. There is also a record of the first arriving preacher to the area in 1812. Reverend Jehiel Weisner was a circuit rider with the Baptist church, and so it was nothing more than occasional visits to a few local worshippers. 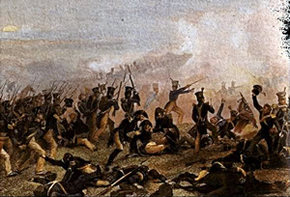 The War of 1812 set the region’s new growth to a crushing halt. Many of the app. 2-3 dozen families new to the area soon learned the skirmish near the Canadian border wasn’t going to end quickly, and they were too close to be safe. It was a terrifying time for everyone living in the area; at any moment they could be attacked by the British- or more likely the Native Americans hired by the British to burn, murder and devastate without warning. Some families fled and never returned, while others left and hoped for a quick resolution so they could keep the land they’d worked hard to attain. A few families remained, and some of their fathers and sons became soldiers in the war. Many of the families who stayed created hidden shelters deep in the woods or thickets, to protect their food and other supplies if the British attacked. The War finally reached Kempville and the surrounding area, largely due to the actions of James Van Horn and his staff. They had been supplying Fort Niagara with flour from their gristmill. The British troops were halting supply lines and attacking military targets, and so in December 1813 the Van Horn mills were targeted. A small number of British troops, supported by a healthy army of local natives, marched north towards Kempville. Their orders were to burn every family home and business west of Eighteen Mile Creek, which they accomplished very quickly. Once they reached Kempville at the mouth of Eighteen Mile Creek, they burned every house and business they saw, with one exception: the family home of Burgoyne Kemp, the little hamlet’s founder. A small squad of British soldiers and their commanding officer took pity on Burgoyne’s ailing mother, and Burgoyne hosted them all on his property with meals and places to stay the night. There are stories of other locals saving some possessions and property by bribing soldiers with food and alcohol. Only a few families lived east of the creek, and most were all spared from the orders. The Van Horn’s mills were burned- although the Van Horn’s home was spared and apparently they were permitted to save some flour and other foods from the mill before the burning. It was widely assumed the soldiers were bribed with food, drink, and shelter for the night. Up until this time most families or businesses sat on the west side of the creek, but following the attacks the east became more favored for homes and businesses. Jacob Albright’s saw mill was also burned by the British in 1813 but he quickly rebuilt it. One of the biggest difficulties for the early settlers were decent roads, which were largely non-existent unless the locals built them on their property or worked with neighbors to create longer ones (one of the earliest was Coomer Road, carved out by Benjamin Coomer along his property before his death in 1817). The best options for finding clear paths however, were ancient indigenous trails, a few well-known ones being along Lake Ontario (Lake Rd.) and Eighteen Mile Creek (East Creek Road; later Lockport-Olcott Rd. ; this was not as well-traveled and so was better carved out in 1809). The most popular trail however, was the oldest in the area- the long ago edge of Lake Ontario before the waters receded. Now known as Ridge Road (Rte. 104), this old delta was the most commonly used route for new pioneers to reach the area, or to continue west or south to Buffalo or Niagara Falls. The path was rough and often through dense forest, but it was slightly higher land which kept it dry consistently. Except for one point, south of Kempville, which was swampy, similar to the rest of the nearby land. The swamp was a few miles long, before it returned to the higher, dry trail. It was up to travelers to continue through the mud and muck, or find a way around it. The War of 1812 changed this land’s destiny, as the U.S. Military recognized the need for a straight path. They built a log (or corduroy) road straight through the swamp, allowing a direct trail, albeit still terribly bumpy and quite wet. Now the infantry could quickly move back and forth from Fort Niagara. Shortly after the trail was completed, Thomas Barber purchased land at the southwest corner of the intersection of Ridge Road and East Creek Road. He built a log tavern, seeing an opportunity for weary travelers and soldiers to rest before continuing their journey. His vision quickly proved correct and was profitable. Following the war, families from all over bought every available plots of local land very quickly, many recorded to be Quakers. You may even recognize some of these family surnames: Coomer, Tompkins, Halstead, Buck, McClew, Patterson, Cooper, Meade, Hess, Newman, Hays, Pease, Phillips and Wright. 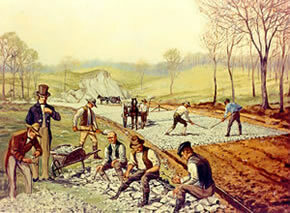 Many families helped build smaller roads that would connect their properties to main roads. Between road construction and the ownership of large plots of land, most of the town’s founding families are now honored as road and street names in the town. Other known early families include those of Shubal Merritt, Benjamin Halstead, O.C. Bordwell, Phineas H. Corwin, David Wisner, Amos Strong and Zebedee Stout. As more families were setting up homes and businesses south of the Millville area, locals decided it was time to designate their part of tue region with an official name. This would help others find where they lived, create a sense of pride for the area, and most importantly more easily receive mail. The Honorable George R. Davis, who owned one of the largest estates in the area, chose the name Charlotte, after his daughter. The village name quickly evolved to Charlotteville. Millville, the land between Kempville and Charlotteville, also had a few other names by now, including Van Horn Mills and Hornsville, since a number of this area’s mills and businesses were owned or supported by the Van Horn family, and many nearby families worked for them. Charlotteville saw many new stores open in its first decade, including the first school, blacksmith shop and trading post. They were all located at one road intersection, which quickly became the center of activity in Charlotteville, prompting all other incoming businesses to set up in this area as well. For this reason, the intersection became part of the town’s original (and still used) Main Street. Nearby was Wisner’s Carriage Works, owned by the well-liked James Wisner. Alexander Butterfield moved here in 1814, and served as the village’s first physician. Mr. Butterfield would eventually wear many ‘hats,’ including that of first postmaster (1820) and later one of the first commissioners of the common schools. 1816 saw the arrival of another circuit rider, Methodist Elder Mairs. He came to help with the newly organized Methodist Episcopal Church (1815). The first official cemetery came in 1817, located west of Kempville. Prior to this, families often buried their dead on family estates or lay them to rest in a graveyard along the west bank of Keg Creek. But cemeteries were fast becoming the popular option around the world because graveyards took up valuable property space and often carried disease. Health issues were already a major concern to people living in Northern Niagara County, many of whom were riddled with lung problems due to the heavy amount of marshland covering northern Niagara County. It became important to start new, centralized places to bury the dead that were further outside town borders- occasionally even exhuming bodies and moving them to a cemetery. While Newfane now has a few cemeteries in its borders, the first cemetery is still in use today, and is located along Lake Road. Meanwhile up along Ridge Road, Alva Buck saw the wonderful success of Thomas Barber’s Tavern, and chose to build his own about 1817, directly across from Barbers. Unfortunately, Thomas Barber died in 1818, leaving his wife to continue on with the business, until the tavern caught fire in 1820 and killed two of their daughters. The family did not rebuild. Only Alva Buck’s tavern remained, and in 1822 he leased it to Solomon Wright, who purchased it completely by 1830. Under Solomon Wright, the tavern was expanded and remodeled into a tavern and hotel, making it a very popular destination. Mr. Wright’s impact in this region is why the ‘swampy’ trail intersection become known as Wrightsville. Wright also held land here for his private estate. In 1826 he successfully petitioned the U.S. Government into making his home the hamlet’s first local post office, where he remained postmaster for 45 years. Brothers Peter and James Hess carved out Hess Road in 1821, with major support from the highway commissioners. Being another road that connected Ridge Road to Lake Road, it greatly helped trade and travel within the easternmost part of Newfane. For this reason, the part of Hess Road where the brothers lived, along with the surrounding area, became known as Hess Road Station. Hess Road Station was also later known by some as ‘Swigertsville’, after the family owned general store located in the community, but this name was never official. 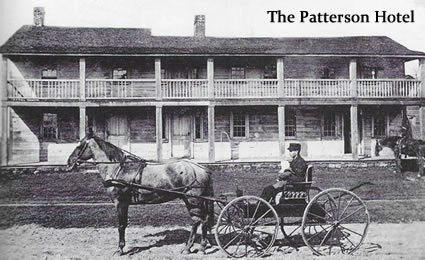 Arthur Patterson, an early settler of Charlotteville, built The Patterson Hotel in early 1823. It was built on the northernmost end of Main Street at the time, on its west side. The hotel had a number of carriage houses, making it an ideal stop for travelers and their horses. Behind the hotel there was a popular ice-cold fresh water spring, where plenty of locals and visitors would stop for a drink and to refill their canteens. Mr. Patterson was also one of the first local businessmen who saw the need to fully establish Charlotteville as an official village. Otis Hathaway, of Lockport, purchased various pieces of property and helped Patterson to lay out a geographical plan for their new village. This included breaking Hathaway’s property into smaller plots of land around a better structured system of roads, which would help people easily enter and exit the village. Mr. Patterson helped clear all this land and establish the roads at the same time he was building his hotel. Hathaway then sold the small plots of land to families, further growing Charlotteville. Much of their plan remains visible in Newfane today, thanks to Hathaway and Patterson’s planning and insight. By late 1823, local businessmen and politicians recognized a need for their community to become an official town. With the growing population it was important to establish local rules and laws, establish taxes to pay for community used items such as roads and schools. This was also a way to gain financial support from the state and federal government to help fund local projects and continue growing the region. One of the businessmen, James Van Horn offered his newly built two-story brick home (the first of its kind in the area), as a meeting place. And so, on April 6, 1824 the first town meeting was held. The gentleman worked together, with maps, and carved out their new community in part from lands currently considered by locals as pieces of early Wilson, Hartland and Somerset. Part of the decision to include all the different hamlets were because the gentlemen at the meeting lived in them and wanted their lands included in the new town. In the end, they carved out a rectangular map of the town’s borders, extending from the southern shore of Lake Ontario south for app. 6 miles, and east to west app. 8 ½ miles- encompassing app. 50 square miles of land. Their new town would encompass the villages of Charlotteville and Kempville, and a majority of three hamlets. The first was the small hamlet of Millville which stood between the villages, and the second was the northern half of Wrightsville which stretched from Charlotteville to Ridge Road (the southern half was private property owned by people who were more connected to the burgeoning village to the south; a decade later they would be part of the new Town of Lockport). The third was Hess Road Station, the tiniest of the hamlets and located east of Kempville and Millville. James Van Horn’s wife Abigail was also present at the meeting, as it was being held in her home. She requested the town carry the name of Newfane, likely because it was identical to a town she had known in Vermont (named for Earl John Fane). The name was approved, and New-Fane became an official township. The hamlet of ‘Millville’ was renamed Newfane Station, and continued to be the land connecting the larger villages of Kempville and Charlottesville (the name had slightly altered over the years between Charlotteville and Charlottesville, and now was primarily called Charlottesville). Next, the group selected officers to oversee the town. Based on meeting records, the following officers were elected: Supervisor James Wisner, Town Clerk Jonathan Coomer, Assessors Cornelius Van Horn, Solomon C. Wright and Jacob Albright, Collector John B. McKnight, Poormasters Ezra Barnes and Zebulon Coates, Commissioners of Highways Robert McKnight, Archibald McDonald and Jacob Albright, Commissioners of Common Schools Alexander Butterfield, John P. Warner and Archibald McDonald, School Inspectors Simon Newcomb Jr, Peter Hess and Herman Pratt, Constables John McKnight and George Bennett. The Van Horn’s accepted the responsibility of maintaining a place in their home for town records and future meetings, making their home the unofficial first town hall. It remained that way for a number of years, until they were relocated to a storefront on Main Street in Charlottesville. One of the earliest records of town business came only a few weeks after the township’s creation. On April 19, 1824 the township was divided into eight school districts, to better divide the children evenly between the schools while also instituting an early standard practice of educating. By 1830 there were 370 children taught in the common schools at a cost of $427.10. Early school tuition was ¼ cord of wood piled at the door or its equivalent in cash. An 1825 record showed the entire town and hamlets had a population of 919. 1825 saw the opening of the Erie Canal, a grand project that helped speed up shipments and improve the New York and U.S. economy. The surplus waters of the canal discharged into Lake Ontario by way of Eighteen Mile Creek. This was great news for local mills, which saw a great surge of energy coming through the expanded rushing waters. Even more mills began popping up between Ridge Road and Kempville, helping Charlottesville’s economy greatly. Local mills included William Collins’ Flour Grist Mill, Tompkins Grist Mill, and the Van Horns’ Flour Grist Mill and Woolen Mill. The Van Horn’s businesses also included a brickyard, tavern, general store and later a clothing outlet. A lumber mill came later for the Newfane Basket Manufacturing Company. Some of the mills also had their own dams to harness the water power, and towards the end of the 19th century used water wheels connected to electric generators. By now the town’s population was growing annually, in large part due to growing need for employees at the mills. The arriving families also brought their various religious beliefs, and the need for places of worship. 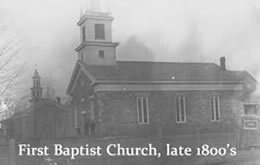 The first major congregation to form was the First Baptist Church, which organized on May 27, 1829 in Charlottesville. Elder Jehiel Weisner was their first pastor. The parishioners’ first meetings were held in between private homes and a school house. In 1835 the public services were transferred to Olcott, which caused a temporary division in the society; the factions were reunited in 1839. The present cobblestone church was erected in 1842, and remains in good condition and use today. The local Methodist Episcopal congregation also was growing, and was officially organized on April 22, 1844. Early services and classes were held in a local log-made schoolhouse, with James Mathews leading them. Several circuit riders also passed through and preached whenever they could. Their cobblestone church was built in 1844, and records state it was 40x50 in size, cost $2,000 and could seat 300 people. The land was donated by Charlottesville’s naming founder, George R. Davis. In 1835, a veteran of the War of 1812 arrived in Wrightsville. His name was Col. John Henning, and he purchased a 270 acre farm which was split in half by Ridge Road. The Hennings became the hamlet’s most prominent family after the Wrights, and Col. Henning was known as the “unofficial mayor”. In 1839 the government officially changed the hamlet from Wrightsville to Wright’s Corners. The reason why has been lost with time, although one guess is it was changed on purpose (or clerical mistake) due to its neighbor hamlet’s name of Warrens Corners. An early post office in town was built on Coomer Road, and opened on Feb. 3, 1836. The post office was in service for one hundred years before being torn down in the 1930’s. During the 1850’s Daniel Van Horn, eldest son of pioneer James, discovered that power could be secured at a lower point along Eighteen Mile Creek than previously thought. He purchased the land and built a very successful sawmill on the site. Besides mills, farms were also in great abundance, the main crop being wheat. That is until about 1850, when a small insect arrived in great numbers: the Midge. These small, biting flies devoured wheat fields all over the region, causing many farmers to switch to different crops that the bugs would not infest. Fruit orchards became the easy choice as a large variety of fruits grow well in the local climate. The two most popular fruits to grow were apples and peaches, followed by cherries, pears, quinces and plums. Grapes were grown at farms surrounding the town, but rarely in Newfane as the soil and temperatures were not well suited for grapevines. Farmers had great success with their orchards in the hamlet of Hess Road Station. By the mid 1850’s a large amount of apples and other tree fruits were stored and shipped from the area. Hess Road Station also was the home of a coal office and the Shaffer family’s feed store. The Shaffer’s store had a large room upstairs which they considered a hall. It was used often for public gatherings, including dances and political speeches. At times they also created a makeshift skating rink. In 1859 another congregation formed in the area: St. Bridget’s Roman Catholic Church. John Malloy donated some of his land on Ewings Road for their new church, and the first priest was Father Hugh Mulholland. Presbyterians also were growing in numbers at this time, often holding services in a school house. In 1872 the Henning Family in Wrights Corners donated a piece of their land for the first local Presbyterian Church, with Reverend E.P. Marvin their first preacher. Meanwhile the town’s school districts were slowly expanding, and had reach 16 by 1860. Within the next few decades it became 18. Other religious factions were also now in town, including Wesleyan Methodists and the First Universalist church. St. Bridget's Roman Catholic Church, on the Ewing road in the southwest part of the town, was organized in June, 1859, under direction of Rev. Thomas Shehan. Daniel Van Horn retired in 1863 and sold his sawmill property to Francis Niles. Niles, along with partner Van Ostrance, turned it into a woolen mill known as Charlotte Woolen Mills. They operated the business until 1866, when they were succeeded by H. B. Gulick. A post office was built in 1863 as well, on Coomer Road, with Theodore M. Titus as its postmaster. Around this time a natural salt lick was discovered 100 yards north of the Ide Road Bridge, a popular place to find deer and other animals. It lasted until around 1915. One of the busiest stores by now was the General Store on Main Street in Charlottesville. Here you could purchase groceries, hardware, dry goods, shoes, clothing, confections, tobacco and medicines. It was also the location for the town’s main Post Office and the primary stop for the stage couch, which arrived and departed only once per day. Following the civil war, the town of Newfane voted to become a ‘dry’ town, banning the selling or serving of alcohol. This law remained in effect for many decades. Among the hardest hit was The Patterson Hotel, by this time a mainstay in Newfane for over 40 years. The Patterson was well known for good lodging and serving popular food and drink. Without liquor the hotel couldn’t maintain a profit, and soon after was turned into residential quarters (the building was torn down in 1906 and its parts recycled for use within other buildings). Wright’s Corners, now simply Wrights Corners, had become a popular destination. The tiny community had hotels and taverns, and stores which kept supplies and necessary travel services, including tending to horses and carriage repairs. For travelers, it was an ideal resting point along Ridge Road or those following Eighteen Mile Creek. For locals, the stores, schools and later churches were important. For travelers and locals alike? Wrights Corners had alcohol. Wrights Corners was now split in half; the northern part belonged to “dry” Newfane. The southern-half was part of Lockport, a “wet” town. Since Wrights Corners sat in both, the laws were loosened here. The taverns were always busy and quite successful. Unfortunately, in 1861 Solomon Wright’s hotel caught fire and burned down. It was never rebuilt, and Solomon passed away in 1872. Col. Henning had passed away two years prior, and his sister Janette, also well known in the community, ran their tavern until her death in 1877. The Henning Farm passed onto nephew John Henning II, who resided there with his family until his own death in 1893. A road on the property, once called Henning Road, is now Wheeler Road. These losses eventually stalled growth in Wrights Corners, as most incoming businesses preferred to establish near more populated areas such as Main Street in Newfane, Olcott, or Lockport. For nearly a half century, the town of Newfane had no dentists. Residents would rely on their family doctor to handle any mouth or tooth issues. This is likely why in 1887 a traveling “dentist” visited the town briefly, and had a successful visit. He stood on a platform across from the General Store, selling his cure-all, “Quagwa”, at $1 per bottle (we are not sure what the contents were). Later he stayed at a nearby hotel and for 50 cents would remove teeth ‘painlessly’ – possibly using the first anesthetics brought to town. By 1874 railroads had become a major form of nearby transportation for both passengers and supplies, largely because they were in better shape than many of the town, county, and state roads. Local stations soon included Lockport, Hess Road (opened in 1876), Coomer and Newfane. Passenger trains passed through the main stations six times daily, while freight trains arrived at all of them around twenty times per week. As the town kept growing, so did the need for post offices. Newfane Station’s post office was established in August, 1876, with J. H. Mandeville, postmaster. Hess Road Station’s first post office opened, and F. H. Ferguson was one of the earliest postmasters. Local churches were flourishing, and new factions were popping up all the time. The Presbyterian church of Wright's Corners was organized May 12, 1872, with thirty members, and had a permanent building within a year. The Roman Catholic Church at Olcott was built about 1884. The Free Methodist church was erected about 1886, a society having been organized a few years before. By 1878 there were 18 school districts in Newfane, with 1,095 children between 5 and 21 years old, educated at a cost of $2,484.26. Most of the rural schools had one teacher who taught all eight grades and were paid six dollars a week. Just as it was across the nation, during the late 1800’s Newfane was a major center for political events and patriotic celebrations. Before Election Day each year, young trees were cut down and joined to form a pole around 100 feet high. An American flag was flown on top with the Republican banner beneath it. This was because the community was largely Republican; during this time one of the larger political organizations was the Republican Marching Club. Very often events would have marching demonstrations and live music, occasionally using the nearby Town of Wilson Band. Of course the best entertainment came from the attendees; speeches, lectures and arguments were commonplace, and occasionally there were physical fights between Republicans and Democrats. On Friday, Feb. 17, 1883, an ice jam on Eighteen Mile Creek broke apart, thanks to slightly warmer weather and overnight rainfall. At app. 4am the jam released a massive flood of water, the ice cracking and rushing water both so loud that nearby residents were awakened. The water rose over 15 feet in only a few minutes, and quickly took out the iron bridge at Charlotte, along with destroying Van Horn’s mill near Burt [Newfane Station at the time] (the Van Horns’ would quickly rebuild it). The iron highway bridge had been built for $1,200 in 1879, and although it was new a few bystanders said the bridge fell apart as though it were nothing more than cobweb. As the water and ice continued sweeping north, it collapsed the Iron railroad bridge as well, which was built in 1877 at a cost of $35-45,000. This bridge, which was 370 feet long and 90 feet high was built by the Lake Ontario RR company and considered one of the finest built at that time; when it fell it was newly acquired by the RW&O railway company. A train was headed toward the bridge and could have been lost if it had been a few minutes faster; fortunately it was able to double back after hearing the bridge was out. Somehow the swing bridge in Olcott was damaged but survived, possibly only because it was miles down the creek and gave the water some time to level off. A few other mills were damaged but survived, although flooded with over 8 feet of fast moving water – including William Collin’s grist mill and Shaw, Vincent & Company. In the end only two bridges from Newfane to Olcott remained standing, including the lower highway bridge at Charlotte which was only 2 years old. The water also flooded south, causing flooding as far away as Pendleton. By Feb. 19, two days later, the weekend freeze up had ended and the danger of more flooding had passed. Newfane Basket Manufacturing Company was founded on April 15, 1887. It opened on McKee Street and was profitable early on, becoming known as one of the bigger businesses in town. The business soon expanded to include lumber and millwork, and eventually it became the Newfane Lumber & Manufacturing Company. Francis Niles and his partner Mr. Van Ostrand now decided to expand their business, Charlotte Woolen Mills, and so they purchased their first generator. This was the first electricity in town, and it helped grow the mill production greatly. After a time they sold the business for a great profit, and the mill would be exchanged between hands a few times over the years. By 1891 it was purchased by the brand new Lockport Felt Company. The location was perfect for a large factory, due to the property’s large space of flat land along the edge of Eighteen Mile Creek. At one time they employed forty-five people, who produced felts for use in paper and pulp mills. The quality of the product was so amazing that it was sold all over the world at very high prices. 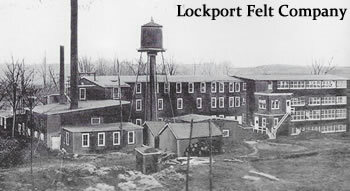 Lockport Felt Company quickly upgraded their mill’s dam and generator, which became so powerful they allowed the community to take advantage of electricity for the first time. Charlottesville contained most of the new electric lines, since it was where the mill was located. 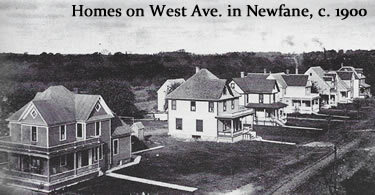 The Town of Newfane established The Newfane Electric Company, which was responsible for the maintenance and distribution of the electricity throughout the homes, businesses and street lights. The first electric lighted home belonged to Joseph Robinson, then Superintendent of the felt company. The first business after the mill was the barber shop and pool room, owned by Howard Wilbur. The first electric contractors were Glen Corwin and Joseph Tyler. Newfane gained popularity around this time for the wonderful local fruits, often exported to other parts of the country and Europe. Local farms were very busy, and so one resident invented a special fruit grader to help sort their large amounts of crops. This invention helped farmers beyond Western New York as well. 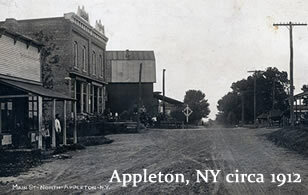 The popularity of the fruit orchards around Hess Road Station helped inspire those living in the hamlet to officially change the name to Appleton in 1895, which is the name registered by the U.S. Post Office that was new in town. Appleton now had a post office, along with John G. Swigert’s Swigert Hardware (a general store), Ed Howard's bicycle shop & pool room, Frederick Ferguson’s Ferguson Coal and Grain Elevator. Later came William G. Hall’s store, W. G. Hall, General Merchandise, and businesses owned by Ira Dickson, and Henry Betzler. You can see the sign from Hall’s store on the General Store at the Newfane Historical Society’s Country Village. By 1894 the last of the mills left in the area ran by the Van Horn family were shut down. This was largely due to practicality- inherited through the relatives of James Van Horn Jr., there was little interest or ability from the family to keep them open, and they were no longer modernized or competitive enough to be purchased by anyone else. An era had ended (Burt Van Horn’s family maintained huge farm operations in Newfane for another decade). By 1900 the electric service had been extended to the hamlet of Newfane Station and the village of Olcott. The demand for electricity had become more than the mill’s dam could supply. Within a year construction would begin on a new, large dam in Newfane Station. The project was spearheaded and funded by the newly created Lockport and Newfane Power and Water Supply Company, merged from Lockport and Newfane’s electric companies. It took years to secure the land, rights and money. During this time, the Town of Newfane underwent some very large and important changes. As the majority of the town’s activity, buildings and Main Street stood in Charlottesville, the decision came by community leaders to once again re-name the town’s districts. In 1901 Charlottesville was renamed as the township or village of Newfane, and the hamlet that carried the same name would be changed from Newfane Station to Burt. This was in honor of one of the most accomplished citizens to come from the hamlet, the Honorable Burt Van Horn, who among his titles included both U.S. Congressman and Assemblyman. These name changes caused a variety of businesses to change their names to follow suit; one example is the Newfane Trolley Station which became known by its more remembered name: Burt Station [for more on the electric trolley which passed through Burt Station, see Olcott history]. 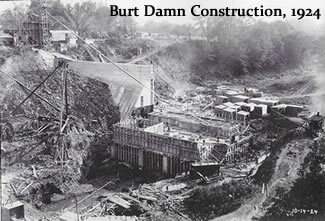 Once the new 60 foot electric dam was completed, it was named the Burt Dam since it was located in the hamlet of Burt. Now the town had a major means for supplying the entire community with electricity. On the edges of town, the Middleport Gas and Electric Company also brought in power from Niagara Falls, one of the largest electric power sources in the world, to help reach the Town of Newfane’s far south and eastern portions. About 1900, the Bell Telephone Company arrived and installed the town’s first telephone switchboard. It stood in Newfane on the second floor of the Collins Store near the Lockport Felt Company, and it had two main lines with ten subscribers per line. All the subscribers were a mix of the wealthier families and those who were fortunate enough to live near the store. An operator was only hired for daytime hours, and so in the evening the two lines became one line for all twenty phones. This was common in those days, a slight burden for the families who were interrupted by a ring not meant for them. About 1906 the Home Telephone Company chose to install their own switchboard above Whitings’ family barn, which was located on the south-east corner of Maple Street. This greatly expanded the number of telephones in the town. Bell now decided to build their own building on the Collins Store property, further expanding their company’s reach in the community. Unfortunately Bell’s building wasn’t open very long before burning in a fire, and the owners chose to rebuild in another part of town (in 1948 the burned building was finally removed and the property became the parking lot for the Lockport Felt Company). The Cornet Band of Newfane also started around this time, enjoying wide recognition in their day. They performed for decades and won many contests they entered. The leader was Irving Halstead, brother of Oliver of Lockport. Outstanding musicians among them were offered positions elsewhere, but no records remain with details. Unfortunately, very little facts and files remain of the band’s work and time, and no audio recordings were ever known to be made during performances. By 1905, the 275 inhabitants of the hamlet of Newfane depended upon the manpower and equipment of the Fire Brigade at the Lockport Felt Company to act quickly in case of emergency. The shrill steam siren called the firefighters to the Mill for their pumping apparatus. The pump was available whenever needed and they used water piped from Eighteen Mile Creek. The men gathered the horses, loaded the wagons and hastened up the hill to stamp out whatever fire they were called to. 1905 also saw the opening of the first brick school on Main Street. An unusual story from Newfane’s past happened on March 23, 1905, and was noted widely in nearby newspapers as a riot. At 10am, inside a hotel in Burt, owned by the Carrier family. Apparently Willis Carrier, owner of the hotel, was in the barroom when he was confronted by a man who was attempting to apologize for a disagreement he had with Willis at some previous point in time. Apparently Willis dismissed the man’s conversation, and promptly struck the man in the head with a club. The man had been in the hotel with about 15 other men, ages 19-39, and they all were angered by Willis’ actions (large amounts of alcohol played a role). The crowd of men went outside the bar and hotel and began throwing huge rocks at the building and through the windows, destroying large amounts of the property. During the assault of rocks (some as big as human heads), the Carrier family, quickly fled the building. Willis was struck in the face by a rock while trying to gather his children and get them to safety, but he was fortunately not injured too severely. A few hotel guests (traveling salesmen) were trapped in the building, and watched windows breaking and stones land on the beds and all around them. This assault continued for two hours, until finally the Lockport sheriff and his deputies arrived by railcar and caught the four men who remained pelting rocks. They rounded up ten more men the next day. Often a town grows and shrinks due to businesses opening and closing their doors, which often effects job growth and residential counts. 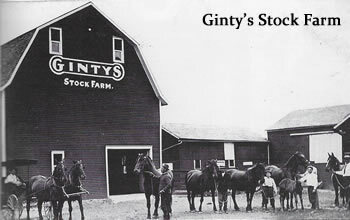 Some well-known businesses in Newfane for a time included a lumber company, which sat next to Collins Mill & Store, the Newfane Basket Manufacturing Company, and the family-owned Ginty’s Stock Farm, known across the county for their sturdy and quality horses, essential for pulling carriages and wagons. One village building with major historical interest began as William Collins Store (pictured above), which was near the corner where the traffic light is today. Soon after the back of the building was turned into Mason/ Dutton Hall, which was used for social gatherings of various kinds; it was the meeting place for rehearsals and concerts by the Newfane Cornet Band, a singing school taught by DeLysle Brookins, home talent plays directed by Billy Slate and more. The Grand Army of the Republic (G.A.R.) met here for a time- a large group in that era. The hall’s use dwindled with time, until eventually it became the warehouse for the Collins Store, and later became the Butterfield Store. When Butterfield Store closed, the building was purchased by Florence and Walter Kruger, and transformed into the town’s first silent movie house, The Arcade Theatre. During this era, silent movie ‘nickelodeons’ were nothing like they are today. Charging only a nickel for admission, they were a storefront with a dozen or so wooden chairs and a piano which played the music in sync with silent movies, often repeating non-stop all day allowing guests to come and depart on their own schedule. Unfortunately The Arcade only lasted a few years, unable to keep up with the technological advances and costs required to be involved in the movie industry. The building next saw life as the repair shop for the neighboring Thompson’s garage. Finally the building was up for sale one last time, and it was purchased by the American Legion who tore it down, using the lumber for their new home on Maple Street. Some locals liked to believe the building found life once again as a meeting place. The property where the building stood would later become the Kendall Gas Station, and later still Newfane Auto Supply and Service Station. The first libraries began popping up now as well. Frank Shaw’s Meat Market is the widely believed to have hosted the first library, which began by a donation of 18 books by Mrs. Fred Shelley. Other locations were above Stern’s Barber Shop, and Smith Store, located on the southwest corner of Main Street’s intersection. In 1906 the Newfane Fireman’s Club was established, as the community recognized the growing need for an improved plan for fighting fires. The community could not continue burdening the Lockport Felt Company’s Fire Brigade, which had limited resources and staffing. By 1911 the club joined together with Charles Miller, establishing the Miller Hose Fire Company. Quickly they acquired two pieces of motorized equipment including a pump, the latest technology available to fight fires. The town installed their water main system beginning in 1912, and a water tower was erected with a capacity of 125,000 gallons fed from a nearby spring, both which vastly improved the firefighter’s efforts to save lives and property. As Newfane’s economy continued to grow through successful local agriculture, farmers needed ways to store massive amounts of produce. In 1910 you could visit a number of cold storages, including Van Horn Cold Storage, Kramp Cold Storage, and the Burt Cold Storage, Inc. Plant. Farmers would bring massive amounts of produce to the buildings by wagon and later truck. One example on record is tomatoes, owned by “Apple John” Santarsiero and Max Pettit. The gentlemen were well known for storing their tomatoes with “tender loving care”, and each fruit was individually wrapped and placed in special crates to sell to consumers. Local produce was also big business for more than farmers and cold storage. Barrels were created and used to ship apples to England before and after World War I. The Burt Evaporator was a business which dried apples, and the Savage Feed Mill was big business in Burt. The hamlet of Burt also had two coal companies, a post office, Daniel O’Grady’s general store, Hotel Burt, and Daigler Blacksmith Shop. The blacksmith shop was popular for replacing horse shoes, and it also had a machine shop and a woodworking shop. They produced ladders, including step-ladders and ones for apple picking, truck bodies and hay racks. For a very brief time Newfane also boasted a newspaper: The Newfane Gazette. It began in 1911 by Mr. Goodell who was both editor and publisher. Mr. Goodell was known for carrying an alarm clock with him everywhere to make sure he would make appointments as he couldn’t afford a watch. Unfortunately his paper would never achieve great profits and shut down relatively quickly. This same year, on January 11, 1911, a handful of interested citizens decided Newfane needed an official library. They elected board members to run it, and began construction not long after thanks to donations. The first Newfane Public Library was located slightly off of Main Street, not far from its current location today. Some other businesses in Newfane in the early part of the 20th century included a new barbershop, Charlie Henderson’s Cider Mill, and a number of gas stations and garages as automobiles became a must-have item for every family in America. David Dairy also opened, which had a milk wagon and was largely in the milk business, but their shop also offered ice cream, milkshakes and various sweet treats. As Newfane grew in size, and Olcott Beach continued to grow in popularity with tourists, the time came for the town to upgrade roads. The project of paving main roads and expanding others largely happened from 1912-1914, and a few of the major routes added the town’s first sidewalks. In 1913 a massive fire destroyed the Newfane Lumber & Manufacturing Company, which was seen by many locals and talked about for decades after. Fortunately the company stayed in business, starting fresh by relocating to First Street. Mr. Charles Raymond, former secretary-treasurer for the Lockport Felt Co., sponsored a bicycle path that extended between Lockport and Olcott, parts of which were never completed. Through the town of Newfane, it was a cinder path 3 feet wide. A license was necessary in order to ride on the path, and Newfane’s constable enforced the law. Although most records are lost, in the last 200 years the town has seen its share of a wide variety of clubs, fraternities, welfare, social groups and secret organizations based on a large variety of interests. One of the larger ones was the Pioneer Association (see The History of Olcott). The First Loyal Temperance Legion in Newfane was organized by Mrs. Loretta Brotherton who invited children to her home on Ketchum Ave. around 1914. Another local group was the Women’s Christian Temperance Union, as Newfane was “dry” until the 1950’s. Other groups included the Niagara County Agriculture Society, Miller Hose Band, Masons, National Grange, 4H, Boy Scouts and Girl Scouts, along with plenty of musical acts and athletic clubs. For local children, education in Newfane usually began in a nearby one-room schoolhouse. 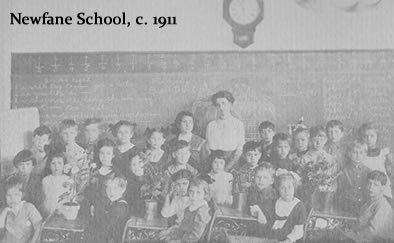 Between 1845 and 1913 there were 17 school building scattered about the area, and only two served children from elementary school through eighth grade. Any students wishing to continue past eighth grade and earn a diploma were required to finish school in Lockport. 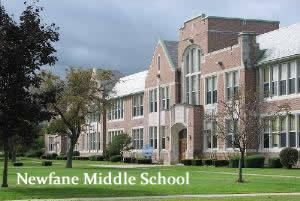 Grades 9 & 10 were added by 1914, and were located in Newfane’s first high school, located on West. Avenue. The State Bank of Newfane opened in 1917 on Main Street, and was in business until 1955. Its building still stands, unused ever since, on the west side of Main Street. In 1924 engineers built a huge dam that supplied electricity to the town of Newfane and surrounding area. Work began on July 25, 1924 and took a year to finish. The dam still provides power today, only it’s one of many power sources now used. Following the implementation of electricity, along with improvements in modern technology, the need for mills dwindled. Olcott’s Marina also quieted as shipping vessels were replaced with planes and shipping trucks. Eighteen Mile Creek was no longer an epicenter for industry or transportation. Today the creek is largely used for leisure, such as fishing and boating. The environment of the water and surrounding grounds have improved with this change, as chemicals, dyes and more often polluted the water from the businesses connected to it. Up until now, local students could only achieve a 10th grade education. Finally, in 1924, the town’s school board applied to the state for a four year rating so they could have a full four year curriculum and graduate students. That same year the school was given permission by the state to add the final two grades, although for a time they required tuition. 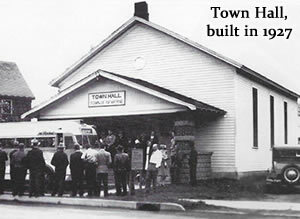 In 1927 the first town hall was built on South Main Street, which would eventually become the VFW Hall when the town hall offices were relocated across from Newfane Elementary School. Clifford Bentley also arrived in 1927, as the new school instructor of science and sports coach. He was hired by the local school committee after discovering him in Rushford, NY. They saw his techniques and manner as vital for the growth of the town schools. By 1932 he became principal of Newfane High School (located on West Ave.). The first Newfane school yearbook was published by the Class of 1936, celebrating the centennial year of the public school system in the town. Newfane schools centralized in 1941, and by 1942 Principal Clifford Bentley already began the push for a larger, more modern high school. Unfortunately World War II and the limited school budget were massive hurdles that put his plans on hold. 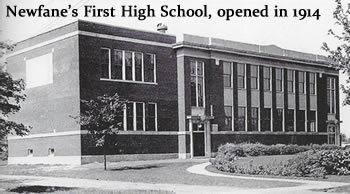 Finally in 1949, construction of a new, much larger, central high school began on Transit Road. Wrights Corners Elementary school was built in 1955, Newfane Elementary in 1958, and Olcott Elementary in 1960. Now, with four large schools in town, all local one room schoolhouses were obsolete. The old high school building on West Ave. would eventually become Grace Bible Church, as it remains today. Newfane Lumber & Manufacturing Company relocated to Lockport in 1940, closer to more of their business dealings. Newfane Lumber has remained there and in business ever since, and to our town's benefit has kept their name and thus the ties to our community. Restaurants have always been big business in Newfane as well. Green Acres Restaurant was in business from 1949-59, located inside what is now the Van Horn Mansion along Lockport-Olcott Rd. This was a popular dining destination that hosted countless weddings. Although open for only a decade, it made such a lasting impression on locals even today, that it’s easy to believe it was in business for a much longer time. Another restaurant that opened in the 1960’s was Castle’s, known for ice cream and diner foods. Their ice cream was a popular attraction that remained open for over 3 decades, and was succeeded (in popularity) for the following 3 decades by Baehr’s Ice Cream Cottage, owned by Judy and Philip Baehr and located in Appleton from the early 1990’s until closing in 2016. By the early 1950’s, local residents and doctors proposed a need for a hospital in town. On June 20, 1953, Doctors Mabel Carmer, Walter Albach and John Argue held a meeting with other local businessmen to draft a proposal. It was presented at a public meeting two months later, in August 1953. After a lengthy discussion, all 300 people in attendance voted unanimously for the proposal. By September they had approved officers and the first board of directors. The hospital was built and opened in 1958 with a new medical wing added in 1968. The Intensive Care Unit followed a year later and in 1973, a medical building was erected on the hospital property. The buildings remain today, although the status of the location has currently dwindled to an urgent care center; parts of the campus are no longer in use. 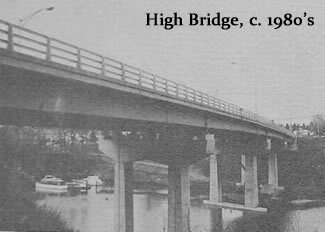 The mid-1950’s also gave Burt a great advantage for easier travel, when a massive bridge was built across Eighteen Mile Creek. This allowed both sections of Burt to be connected for the first time, easing traffic on the bridges in Newfane and Olcott, while offering a new ‘shortcut’ for residents getting to destinations across the creek. In the late 1940’s and early 1950’s, Newfane saw a new movie theatre open near Main Street. It was popular among locals for the new run movies and comedy shorts- anything popular at that time. Unfortunately the business suffered from limited space, terrible land that would occasionally flood, and was never seeing strong enough sales to be sustainable. The theatre closed down in the mid-50’s and remained a vacant building for well over a decade before it sold. As the community is always changing, local schools have always followed suit. After a short life, Wrights Corners Elementary was discontinued; the building was torn down and all students were merged into Olcott and Newfane Elementary schools. Slowly, the size of the community surged, and by 1966 a third, all-new high school was built, and expanded slightly in the 1980’s. The second high school became the local middle school, as it remains today. By the 1990’s Olcott Elementary students merged with the middle school, and all three remaining schools, Newfane Elementary, Newfane Middle and Newfane Central High Schools all had various building upgrades and expansions (including a pool finally added to Newfane Middle, something community members had been debating since the high school’s construction in the 60’s). The Olcott Elementary building remains, still on Godfrey Road, seeing new life over the years in other forms of education and child services. The town noted its 150th birthday in 1974 with an enormous Sesquicentennial celebration. It was sponsored and helped by countless local businesses, and included a newly written play titled “Legend of 18 Mile Creek,” a Queen Pageant and more. The event was held from June 28 – July 6, 1974. Each day had its own theme and special events, including meals, contests, parades, games, rides, lectures, sales, socials, flea markets, displays and so much more. It was one of the largest events in Newfane from the last century, in a community that had grown to over 10,000 persons. This event helped inspire the community to pay tribute to, and help preserve, its own local history. One year later, in 1975, the Town of Newfane Historical Society was established. Of course, Newfane’s history didn’t end in 1975, and even more wonderful stories and information exists about our community from the last 200 years. Thanks for reading what we have shared so far, and to learn more please speak to our local librarians, members of the Newfane Historical Society and our town historian. We may continue updating our look back at Newfane & Olcott, but don’t let us keep you from learning more now!